ADDIS ABABA, Ethiopia -- In a surprise move, Ethiopia's leader on Wednesday announced plans to drop charges against political prisoners and close a notorious prison camp in what he called an effort to "widen the democratic space for all." This is the first time the government has acknowledged holding political prisoners. Prime Minster Hailemariam Desalegn's comments came after anti-government protests engulfed much of the restive Oromia and Amhara regions in recent months, bringing many businesses, universities and transport networks to a standstill. The sometimes deadly protests, the most serious since the current government came to power in 1991, spread into other parts of the East African country, leading to a months-long state of emergency that has since been lifted. 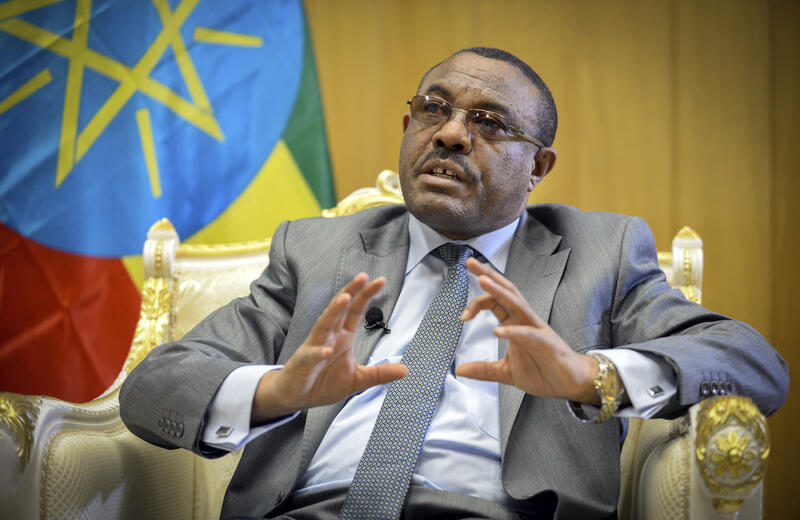 "Political prisoners that are facing prosecutions and are already under arrest will be released," Hailemariam said. "And the notorious prison cell that was traditionally called Maekelawi will be closed down and turned into a museum." It was not immediately clear how many political prisoners were being held across the country, a close U.S. security ally. Ethiopians were quick to respond, even with social media sites currently blocked. "I'm writing you this struggling with my tears," wrote renowned blogger and former detainee Befeqadu Hailu. "All these pledges need to be implemented immediately." Rights groups and opposition groups in Ethiopia had been calling for the release of political prisoners, saying they were arrested on trumped-up charges and were being punished for their points of view. Ethiopia's government has long been accused of arresting critical journalists and opposition leaders. Some of the prominent politicians currently in custody include opposition leaders Bekele Gerba and Merara Gudina. A number of journalists also remain in detention. "Potentially big news," Human Rights Watch researcher Felix Horne said on Twitter after the announcement, as some observers waited to see the government's next move. The protests demanding wider freedoms began in late 2015 and led to hundreds of reported deaths and tens of thousands of arrests while disrupting one of Africa's fastest growing economies. "The crackdown on the political opposition saw mass arbitrary arrests, torture and other ill-treatment, unfair trials and violations of the rights to freedom of expression and association," rights group Amnesty International has said. A tiger tackled a female zookeeper at the Topeka Zoo. The keeper has worked with the tiger for several years. She is expected to survive. Chris Martinez reports. Here's a look at the top stories making headlines on the "CBS Weekend News" with David Begnaud.